Plants that grow in freshwater help keep water clean by stabilizing the bottom surface of ponds, rivers and lakes. They are often used for ornamental purposes in home ponds as well as aquariums. However, some plants that grow in freshwater have few natural enemies, grow quickly and can overwhelm a natural ecosystem, interfering with water recreation and wildlife. Elodea (Anacharis canadensis) is a cold-hardy water plant that grows floating freely just below the water surface. It is considered an oxygenating plant and grows rapidly, providing cover for small fish. Other names of Elodea are ditch moss or water thyme. It is often used by aquarium hobbyists. Corkscrew val (Valisneria Americana) has interesting, long, bright green leaves that form a twisted corkscrew appearance. It spreads by undergound runners and remains rooted in the bottom of the body of water. Hornwort (Ceratophyllum demersum) is native to Australia and is another freshwater plant often used in aquariums because it produces oxygen when exposed to light. It can grow floating freely in water. When exposed to mud or gravel it produces modified leaves rather than roots that anchor it to the bottom. Hornwort has the ability to control algae in aquariums or waterways because it releases a chemical that prevents algae from growing. Water milfoil (Myriophyllum sp.) is another popular aquarium plant that show up in bodies of water. Also known as foxtail, water milfoil is more tolerant of colder water conditions than many other freshwater plants. It has a feathery appearance and remains rooted to the bottom with the branches reaching up toward the surface. It is a good plant for collecting dirt and debris that flows into a waterway. The water lily (Nymphaea odorata) grows rooted into the bottom of slow-moving rivers and ponds that remain at a stable water level. 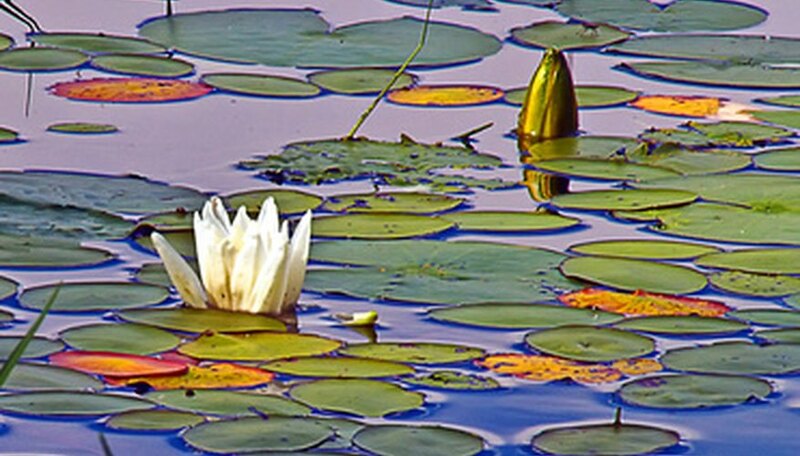 The stems grow toward the light and the main leaf, or lily pad, spreads out over the surface of the water. The water lily is probably one of the best known freshwater plants and produces colorful and, in some cases, fragrant blooms. Another name for the water lily plant is beaver root. Hydrilla (Hydrilla verticillata) is an invasive freshwater plant that forms thick mats below the surface of the water. It was introduced into waterways by aquarium hobbyists. It interferes with wildlife reproduction and water recreation. It can float freely and spread over a large area or remain rooted to the bottom and grow as much as 2 feet per day or, in ideal conditions, up to 25 feet.